The Indiana Pacers finally had their first losing streak but have bounced back with a vengeance. They will take on another tough, young team in the Celtics who are looking to knock them off their perch in the Eastern Conference. 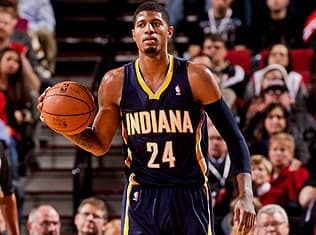 The Pacers had been undefeated at home until last Sunday’s 101-96 loss at the hands of the Detroit Pistons. It was not only their first defeat at Bankers Life Fieldhouse, but it was the first time they allowed an opponent to score 100 on their home court. They followed that defeat with another against Miami on Tuesday but rebounded in a big way against the Rockets on Friday Night. They beat Houston handily, scoring a season-high 114 points in the 114-81 victory. Six players hit double-digits in scoring and Paul George led the Pacers with 24 points. The win moved their record to 21-5 on the year. The Celtics have been a scrappy team this season, but have not been able to put together consistent performances night-in-and-night-out. They have lost four out of their last six games including a 106-99 defeat against the Washington Wizards on Saturday. The loss dropped them to 12-16 on the year. These two teams played on Nov. 22 at Boston. A game that Indiana won 97-82. Indiana played angry against the Rockets after losing two games in a row, and it was impressive. However, the Celtics outhustled most teams and even the athletically gifted Pacers may have a hard time putting them away early. The Cs have lost plenty of close games, but they always seem to hang around till the final buzzer. I think this game stays close for three quarters, but the Pacers clamp down defensively late and get the victory, but we get a Boston cover. The Raptors head south to take on the Thunder in their home arena; a place no opposing franchise has been able to get a win at this season. Oklahoma City will focus on extending their win streak as they already hold the best record in the league. The Thunder are coming off a win 113-100 win against the San Antonio Spurs last night, one of the best teams in the Western Conference. Russell Westbrook paced OKC in scoring with 31 points, and the victory improved to their record to 22-4. The Thunder are their only team to not lose on their home court, posting a 14-0 record at the Chesapeake Energy Arena. Also, after starting the season a bit slow out of the gate, they have won 17 out of their 18 games. The Raptors would seem like an easy opponent for the powerhouse Thunder, but have played surprisingly well as of late, even after trading former All-Star Rudy Gay. However, Toronto has won four out of their last six games and is not laying down for anyone. Forward DeMarr DeRozan delivered a knockout punch to the Dallas Mavericks in overtime on Friday by hitting a jumper with 1:11 left in overtime to give the Raptors the win. Toronto has averaged 104.5 points since Rudy Gay was traded, a more than seven point increase since the deal was made. One thing is clear in my mind about this game. It will be high scoring. OKC is coming off a game last night so their defense might be a little suspect, which is all the Raptors need to put up 100 in this one. The Thunder should clear that number easily, but I do not see them blowing them out of the building. This one will be a track meet, and I think 204.5 is way too low. I am taking the over, and I considered it a very strong play.